Acclaimed documentary screens at 5 p.m. Wednesday, July 7, 2011 on Capitol Hill in Washington D.C. at the Capitol Visitor Center Orientation Theater South. Wild Horse Round Ups, Showing the Truth features Peter Coyote, Michael Blake (Author of Dances With Wolves) and Ginger Kathrens telling of the tragedy facing America’s Wild Horses & Burros from the Bureau Of Land Management. Managing to Extinction is what is happening to our cherished symbol of Freedom, the American Wild Horse. 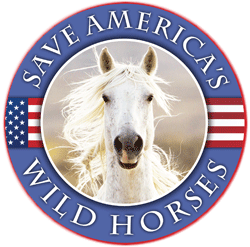 Emmy Award-winning filmmaker and Director of The Cloud Foundation, Ginger Kathrens, is working hard to save wild horses in their native Western states, including California. She will speak at the Western States Horse Expo in Sacramento June 11-13th. Washington, DC (March 10, 2010)—International award-winning filmmaker, James Kleinert, screens his latest star-studded film, Disappointment Valley … A Modern Day Western, featuring Sheryl Crow, Viggo Mortensen and Darryl Hannah, on Wednesday, March 24 in Washington DC. Kleinert’s documentary examines the politics behind the Bureau of Land Management’s (BLM) controversial policies on public lands while questioning the fate of America’s wild horses and burros.